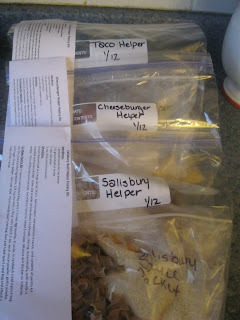 Saving money, controlling the ingredients, AND have a quick "convenience" meal ready to go for dinner is what making your own Hamburger Helper Kits is all about! In this post I am combining the recipes from two separate posts from my sister blog: Tip Garden into one post so you have all the recipes in one place. Choose from: Cheeseburger-Mac, Taco, Salisbury, Chili-Mac, Lasagna, Jambalaya, or Potato Helper. It will only take about 15 minutes to put the packets together with ingredients you probably already have, and then to cook a quick meal all you need is to add a few fresh ingredients such as the meat. I will share the Cheeseburger Mac one here , and you can click over to print all the recipes below. First I'll share the Pantry Kit to assemble and store and below that I'll share the instructions for cooking one up for dinner. 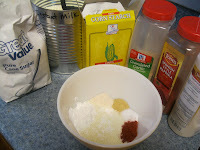 Mix sauce packet ingredients together in a small bowl. 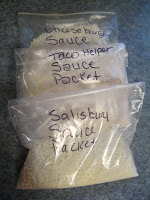 Label a sandwich sized plastic storage bag and pour sauce mix in bag, seal, and set aside. 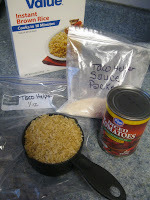 Label a gallon sized ziplock bag and pour in pasta or rice, sauce packet, and for taco helper also place a can of diced tomatoes. Store in pantry till ready to cook. follow the instructions for each individual recipe. Below is the recipe for Cheeseburger Macaroni. Brown ground beef in large skillet, drain grease, add hot water, pasta and contents of sauce packet. Bring to a boil. Cover and simmer on low about 12 minutes stirring occasionally, until pasta is tender. During last few minutes of cooking, stir in the cheese; cover and cook final few minutes till cheese is melted. Turn off heat and uncover. Let skillet dinner sit for about 5 minutes. This will allow sauce to thicken a bit. What is your favorite Hamburger Helper? How do you make it healthier for you and your family?